The forecast is calling for nearly 70 degrees on the first day of spring! I'm thrilled! The Mt. 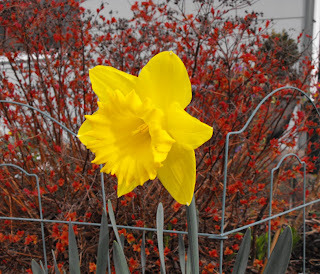 Hood Daffodils are cheerfully gracing the front yard. Weekend plans include breaking ground on our families first veggie garden, which I never thought would happen in our small backyard. Getting all the family members in our household behind this project has been a year + in the making! I'll be documenting our progress this weekend. How exciting! I hope you take lots of pictures of before and after and will share your progress. This weekend will be perfect weather. What a lovely blog you have got. it is great to see spring have arrived your side. Very pretty narcissus. i will be coming again to see more blooms of spring. Very pretty, don't you just love the first flowers of spring.